I don’t remember when I started my first blog exactly, but I think it was sometime in 2005. I signed up for blogger and began writing about my life. I thought it was kind of fun, so I later added a blog called “Things I Learned the Hard Way,” a comical look at the mistakes I have made in life and learned from. I have closed down both of those blogs during my career search, but that experience did help me kick start the other blogs that I have going today. In July, 2006, I started a blog called “Eric’s Political and Economic Insight.” It was short lived, but I resurrected it in December, 2007 as The Israel Situation (IsraelSituation.com). It was around that time that I realized I love blogging. I started reading sites like ProBlogger and CopyBlogger. I just couldn’t get enough. 1,600 posts later, The Israel Situation is still going strong. However, it was when I was reading Darren Rowse’s book that I realized I could really build something special. I was struggling to gain readers in the early days of Narrow Bridge, but I had a steady growth and I was enjoying what I was writing about. However, I got my first big jump in readers, advertisers, and excitement when I joined the Yakezie Challenge. I first read about the Yakezie Challenge from Well-Heeled. Following her lead, I jumped in and “joined the wolf pack” of the Yakezie. The month I joined, my monthly readership doubled! It has continued to grow and thrive with the support and interaction with the wonderful community we have built. One of the best impacts you have all had on me is to motivate me to do what I already knew I should be doing. 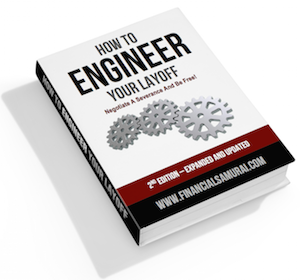 For example, publishing my first eBook: The Personal Finance Arsenal (e-mail me to become an affiliate). Stocks, Bonds, and Funds. Oh My! To echo everyone else, thank you to Sam and each member of the Yakezie for helping me grow as a writer and blogger. I have learned a lot from each of you, and hope to continue learning, growing, and contributing to the success of the community. Eric, sounds like you have a great financial background. What kind of work do you do now, besides blog? I work as a Senior Treasury Analyst, primarily managing a capital leasing program, at a Fortune 500 company. Thanks Dean. Great post Eric. I didn’t realize you’ve been blogging for so long. Cool pic by the way. Thanks Mike. 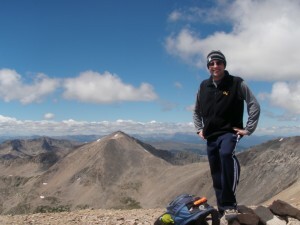 That picture was taken on the top of Mount Bross at 14,172 feet above sea level in August. HA! I wouldnt go trumpeting that around! I love how much variety we have here at Yakezie. Graphics designers, Doctors, Techies, Senior Treasury Analysts… (I’m not sure I even know what that means.) The best part is that we all have a unified goal. Helping our readers and our fellow Yakezie become better stewards of our money. For me, Senior Treasury Analyst means managing a capital leasing program at a large company. For most it means liquidity management, but they are down the hall from me. Hey, Narrow Bridge! Glad to see you’re a part of the Yakezie Network. I came across your blog while I was doing a carnival I think. I was just checking out your site again. I see you offer financial services for an hourly rate, including investment advice, but it doesn’t look like you’re registered as an investment advisor from what I can see. I’m not going to go report you or anything, but I thought you should be aware of the registration and licensing requirements before you get in trouble. I’m sure you’re qualified given your background, but it’s all about the laws you know. Then again, maybe you are registered and I just sound stupid! If you want more information though, feel free to email me. I’d be glad to help point you in the right direction! Best of luck with your blog, business, and career! Thanks for that tip. I don’t give investment or financial advice, I try to help people with automation and simplification. Do you think I would need a series 7 do that, or am I clear? I will not accept money to tell someone what stock or fund to purchase, that is up to them. Hey Eric (sorry I missed that the first time)! You wouldn’t need the Series 7 anyway since you’re doing it on an hourly basis. You’d want the Series 65 (which is easier, by the way). It doesn’t matter if you don’t tell them what specific securities to purchase. I would assume your laws in CO are the same as in PA regarding investment advisors as most states have adopted the uniform code on this topic. The laws say that investment advice refers even to advice about classes of securities and not just specific ones. So if you’re even giving advice about asset allocation, then you’d need to be registered. So as long as you say absolutely nothing about specific securities or classes of securities (except for certain U.S. debt obligations…like Treasuries…they don’t fall in this group), then you’re fine. But as soon as you say something like, “I think a 60% stock/40% bond portfolio would be good for you.”, then you’re considered an investment advisor (assuming you get paid…free advice doesn’t count, but even that’s a sticky subject because there are other methods of compensation). Thanks Paul. I appreciate that and will look into it. For now, I think I might put that page in the holding tank. No problem, Eric! Like I said, I just know what a headache it can be to deal with regulators if they ever come knocking (even if you are following all the legal requirements). I wouldn’t wish it on anyone! That was one of the most stressful times in my life even though I was nearly 99% sure I was right. Messing up on something like this can knock you out of the profession for a long time. Thanks Max! I hope you enjoy the updates. Thanks for sharing – love the automation & aggregation components. Glad to see you putting that MBA to good use ;) and congrats on the eBook! I am hoping to upgrade the sites to look more professional and add a free eBook as well. If I can make a difference for people and make a few bucks while doing it, I am happy. If I could (someday) make a living on it, that would be the dream. The best finance jobs are a mystery… Thanks for the complement. That’s a pretty cool financial background, and great that you didn’t end up in a lot of debt while pursuing the MBA. Student debt can be a big issue for many these days! I worked hard on the background. I agree that student debt is a huge problem today. Many students are spending $100,000+ on a history degree or art degree with no real plan to pay it off. I hope they read my blog! Eric, you sure are a veteran to the blogging scene, I had no idea :) now I know who I am coming to for tips! Congrats on the MBA too! I am happy to help any time in any capacity I can. I have done a little “consulting” (see: free) for friends trying to start up. I have not charged anyone yet, but you never know. Maybe that is my next revenue source? I would have no problem paying. The skill and knowledge you have acquired in the field over the years could be invaluable. If you ever need anything, let me know! Dude, keep killin it in the MBA paydown. That last $13,500 will get knocked out super quick. I am planning on less than two years. Thanks for the comment. Hey Eric, seems like you’re definitely a veteran when it comes to blogging! And you definitely have done a great job with your student loan debt! It’s great to have someone who is writing from both perspectives – a professional and someone conquering debt! 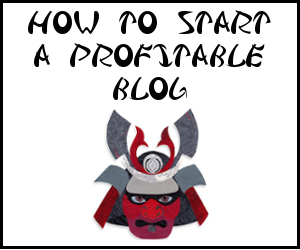 I enjoyed your story and I’m continually impressed with the Multi blog blogger! Looking forward to reading more….. I partially got the multi-blog idea from Darren at Problogger. If I can maintain several successful blogs, I can leverage the readership from each to help the sites grow and thrive. You’ve been really busy in the blogging world! I really don’t know how you manage it all. I enjoy your articles at Narrow Bridge. Thanks for the story – very interesting stuff! Sometimes it is quite a juggle and I end up neglecting one blog to keep the other going. It is probably best to focus on one blog unless you have plenty of time to keep the others going. I learned that the hard way, but I love my topics so I keep them all going. I didn’t know you have been blogging for this long! Great work! I have no idea what this means -“Senior Treasury Analyst, primarily managing a capital leasing program” but it sounds super cool! I am a regular reader of NB and enjoy reading your articles (though my comments always go in spam, so I don’t comment these days :( ) Thanks for sharing your story! I’ve been trying to go through the spam filter every couple of days now and I am keeping my eyes out for fellow Yakezies. I have unspammed your comments a few times. Thanks for being a reader! Thanks for sharing your story. Great work on paying those MBA loans. I went back full-time for an MBA, and had loans to pay back, so I can appreciate the challenge! It is great having someone able to relate. There are not many of us. Hey Eric, great to read your post. I have enjoyed Narrow Bridge and enjoyed seeing you around too. I couldn’t work out if you are Israeli or just have a strong connection from being Jewish? Anyway checked out the Israel blog and although I have widely varying views on a lot of things I like the way you are presenting your side of the argument and the news you are finding…. Don’t worry I’m not pro Hamas either but do live in Cairo right now so am pretty close by. We get a lot of news from both sides of the fence here and I have met many Israeli’s and Palestinians… The truth is most of the time I find neither hate neither and most long for peace, I really think it’s the extremists, the governments and the media that are causing half of the sh*t storm, not the average Joshuas and Mohammeds…. Forest, your comment is more of a complement than you probably realize. I am not Israeli, but I have spent a lot of time there and I have family all over the very small country. I always wanted to make it down to Cairo to see the pyramids, but crossing from Israel was not safe when I had the opportunity so I went to Petra instead. It is a very complicated situation, and I do think that many, many people on both sides are ready for this whole conflict to be done and over. I just worry about the people in charge, as they are the ones who teach hate and lies to their children. Are you worried about the rise of the Muslim Brotherhood in Egypt? Hmmm the brotherhood….. That’s tricky because it’s clear that the reason they have gained so much popularity is not actually a matter of religion but a matter of doing more for the poor than the government ever have. The government here have a habit of pushing the poor around like they are just in the way whereas the brotherhood have been putting care in the community services, providing medical help and such things. If they got in power I think the situation for the poor would vastly improve but sadly things like all the local bars would be shut down and it’s possible that head covering for women would become law and many positions of power that have taken years for women to reach could be cut in a moment…… In government I doubt they would be as hard lined as people think they would as they are sensible enough to know that Egypt would collapse without it’s USA support and the thought of another war with a US backed Israel is enough to stop them starting any trouble in that sense, I think. ….. Best stop talking about this as a black car will arrive to take me away or worse Sam will deem the comment not related to Yakezie and delete it, ahhhhhhhhh!!!!!!!!! Sounds like they have a lot in common with the Hamas rise to power. It is scary stuff. Thanks for the candid remarks. In some ways yes but Egypt is a very different beast to Gaza. It’s very unlikely they will get in power though. Mubarak’s son is being groomed as we speak ready for Sept 2011 sham elections. The only real contender isn’t being allowed to register a party right now for made up reasons. There are so many interesting stories within the Yakezie group! I be sure to check out your other blog!!! Thanks, I hope you enjoy them both. Eric, like a couple of others I still don’t understand exactly what you do but am glad to say there is no mystery about your blog. I enjoy reading it and learning from an expert. I am glad that I am able to make complex financial topics simple even though my job is complex! Thanks Kay. It’s always nice to see a fellow westerner on the yakezie! I enjoy your site and have enjoyed your story and your responses to the comments. I like the picture, but I was unable to get one when I was up there – I turned around at Lincoln and went back. It was a tough hike. I figured I was not going to be back there for a long time, if ever, so I might as well get all four. Thanks for the warm comments Jeff. Keep up the great work Eric!!! Really cool blogging background Eric! I’m impressed by how much of your MBA debt you’ve been able to pay off…I’m going to be rooting right along with you to get out of the rest of that debt!